A fast growing rounded tree with an upright, equal spread. The foliage is bronze green. 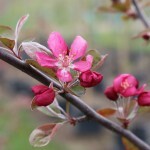 The deep pink flowers are followed by red fruit. Disease resistance is good to excellent. It will grow best in full sun and a well-drained soil.